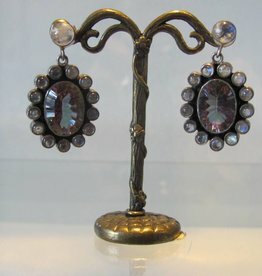 Silver earring with faceted mystic steen , a very special stone with many colours in it. Fine handcrafted silver work. Made by a master craftsman in a workshop with good working conditions. 1,5 cm long excluding the ear hook. Fairly made. The hanger is a mystic stone surrounded with many little cabochon cut rainbow moonstones. WOW! Length 2,50cm without the silver stud that is set with a rainbow moonstone. 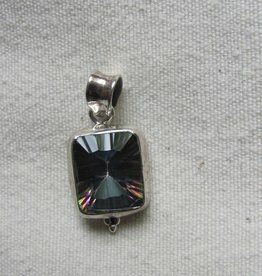 Pendant 2.50cm long excluding the loop. Beautiful mystic stone is hand faceted and set in fine silver by a master silver smith with great working conditions in Jaipur. Fairly made. 2,5 cm long not counting the integrated ear hook . Tear drop cabouchon labradorite stone. Dormeuze model. Material is silver with an electroplated gold layer.